Featuring 5-14 luxurious Suites, 15 full baths, full size private tennis court, beach front swimming pool and more! Hacienda Mágica (formerly Hacienda Kukulkan is now under the same ownership and offers the same services as Hacienda Del Mar and Hacienda Corazon. Hacienda Mágica is able to host weddings and events onsite year round. For larger groups, corporate Retreats, Weddings and Events Hacienda Mágica may also be rented with Hacienda Corazon and Hacienda Del Mar next door. 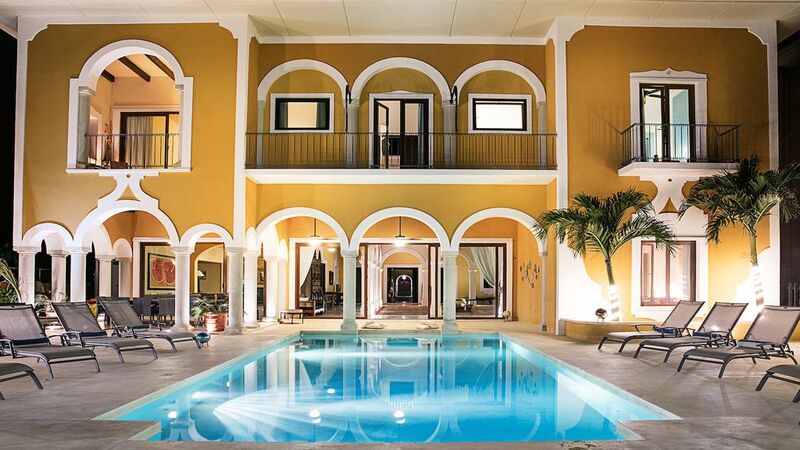 The Hacienda Estate may host events of 250 guests and offer luxurious suites for 90 guests. We have other villas close by for further guests. Hacienda Mágica is our dream vacation home. We discovered Puerto Aventuras through friends and we just adore it here. We love the Hacienda Mágica style architecture right here on the beach. We want our guests to enjoy our home as much as we do! We love seeing our guests enjoy, vacations, beautiful events and magical times together! Please bring your own lap top. Kayaks and Paddle Boards for guests use. available upon request – additional cost. my family booked this for our thanksgiving holiday and 15 out of 19 of us got very very sick. It really put a damper on our vacation. Not sure if the villa wasn't cleaned properly or the food made us sick. The staff was great but I would not go back ever!! We were very disappointed to hear that you and your guests were not very well. We of course are always concerned about the well being of guests. Medical attention did not confirm there were any problems with the home causing this other than viral illness. Additionally, the next week guests of ten people suffered no illnesses whatsoever. A beautiful, relaxing home with amazing food and service. The house offers plenty of entertainment for all ages. The environment is safe and comfortable. It is the perfect getaway! Hacienda Kukulkan had everything one could ask for at a beach retreat! From the scenic views to the amazing food and service, this house was perfect. Being in a gated community it was a very safe environment with restaurants, bars, shops, and ice cream within walking distance. With bikes, a tennis court, stand up paddle boards, and kayaks, all beach activities were easily accessible! The perfect vacation spot!! I highly recommend this place. Its is as gorgeous in person as in the pictures. The staff was extremely helpful, courteous, knowledgeable and overall fun to spend a week with. The food was delicious and authentic. The place is immaculate and close to so many fun things to do. The pool and view is breathtakingly beautiful and I have not one complaint from my magical week in paradise.